I am spending a week volunteering at the restoration of a 12th century fortress on the Camino de Santiago just outside Pamplona in the magnificent countryside of Navarre. I greet passing pilgrims who walk by while the new owner of the property works on the project. They are on their way to Santiago de Compostela in far off Galicia, while he works to create a moment’s refuge for them here. 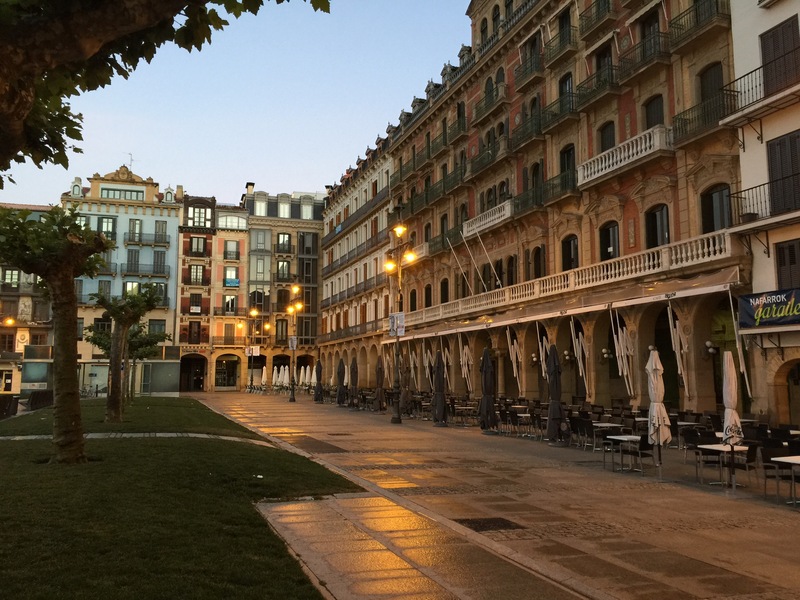 I am staying in Pamplona at a regular hotel, not an abergue or pilgrim’s hostel. Since the hotel does not serve breakfast until 7:00 a.m., I wander out each day with my camera and my little daypack, my bottle of water filled, and my iPad to go to the only cafe I have found that is open at that hour – the Taberna on Carlos III. This minute cafe with three tables is part of a chain of small restaurant cafes. There is a refrigerated case with hams and cheeses, some yogurt and some sodas and the rest is bakery. Every day, I show up around 6:30, 6:40 a.m. to get my coffee, my juice, and my toast. While I am having breakfast, they make me a sandwich so I have something to take for lunch. The juice is made in a large silver contraption that funnels oranges down two chutes to be pressed into an aluminum pitcher, then ceremoniously poured into my glass. Typically, I like a croissant “a la plancha,” meaning toasted on a press, but here they drizzle it with honey and it’s just too sweet for this hour of the morning, so I opt for French bread toasted with a little butter. I used to be a cafe con leche guy but last December, my daughter turned me on to cortado. It’s the rough equivalent of a cafe con leche if you used only half the leche and it’s really great. Since there’s so little milk, it’s not so sweet as a cafe con leche and I like to think it gives me tremendous credibility with the locals when I order it. The locals. This is the spot for the locals – even though it is on one of the main drags because there are no tourists up at this hour and the Camino does not go by the place. In theory, I would guess it is mostly people on their way to work or to open the shops and banks. But in practice, it is more of a lesson in Spain. When I go there this morning, a few minutes earlier than usual this week, I had to ask the woman behind the counter where the “vieja” was. Where is the old lady? It was the first time this week I had not seen the Maroon Woman, and in typical New Yorker fashion, because I didn’t see her here, I started to worry about her. Maroon Woman is roughly my age, I would guess, maybe slightly older, who has worn the exact same outfit every single day, having breakfast here every single day, but eating something different every single day. She is boxy, with a maroon knit jacket, a maroon knit skirt, and a maroon patterned T-shirt. She has white-stitched loafers and her hair needs to be introduced to a comb at the very least. She says barely a word past the order to the counter woman – she comes, she eats, she leaves, I guess, because by the time I have finished and packed up my lunch, she also has finished eating but is still there. There is a young girl too who gets her breakfast here. She too wears the same thing every day and I have not focused on what she orders because I am fascinated that a 30-something would not be more fashion-conscious, but clothes are expensive and no one cares that she has the same leather jacket, the same cream cardigan the same jeans, the same suede boots. In so many ways, she is like the Maroon Woman. A late 40s woman comes in last. She wears her gray hair up over her right ear, caught by a single Bobby pin. She wears the same shoes, the same coat, carries the same bag and only once did she take a table to sit with another woman. The last of the regulars might be the manager. He is very good-looking, early 40s and he takes a copy of each newspaper to place it on a wooden dowel that goes into a display so people can read with their cortados. Then I pick up my sandwich and my Aquarius, which is a kind of flat, lifeless lemonade that I love, and I take off. I can only imagine the conversations about me after I leave. Posted in Camino Frances. Tagged Amigo, backpacking, Camino, Camino de Santiago, caminodesantiago, cathedral, hiking, navarra, New York, pilgrim, Spain, the_abbey, travel.